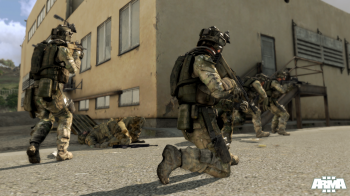 The CEO of Arma studio Bohemia Interactive says that for every three legitimate customers playing its games online, there are 100 attempts to play with a pirated copy. Bohemia Interactive takes an unusual approach to anti-piracy measures. It uses a system it calls DEGRADE to mess with illegitimate copies of its games; in the Arma series, for instance, weapons in pirated copies have lower accuracy and they occasionally turn into birds with the words, "Good birds do not fly away from this game, you have only yourself to blame." In an interview with PC Gamer, Bohemia Interactive CEO Marek Å paněl acknowledged that there's really no way to tell how effective that system is compared to more conventional DRM. He did, however, make a claim about piracy numbers based on multiplayer statistics that, at first glance, is nothing short of astonishing. "Our statistics from multiplayer show that for every three legitimate buyers playing their game in multiplayer, there are 100 [failed] attempts to play with a pirated version," he said. "This indicates that piracy is an extremely widespread problem on PC, and it's also really worrying for us as a mid-sized, independent, PC-oriented developer. We do not have any such data for single-player, but I'm afraid there the ratio of pirates to legitimate gamers is undoubtedly much worse." A 3-to-100 ratio is obscene, but Å paněl's statement is both vague and a little misleading. Is that one guy trying to connect 100 times? Ten guys going ten times? There's no way to tell - or if there is, he's not saying - but it's not reasonable to think that people people will try once, fail and then give up. Piracy is bad, yes, but I have a hard time believing it's that bad.